The PCI-SIG (Special Interest Group), PCI spec controller group, announced the transfer rate for the upcoming PCI-Express 3.0 specification, expected to debut by the end of 2009 or early 2010. According to information, current specifications exist in the version 0.7, whereas series products with the support of new interface will appear not earlier than 2011. PCIe 3.0 will have transfer rate of 8GT/s, compared to PCIe 2.0’s 5GT/s. GT stands for GigaTransfers per second, and differs from the standard unit of measurement due to PCI-Express encoding system. The encoding system is 8bit or 10bit. 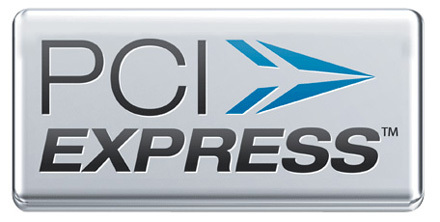 PCI Express 3.0 uses the same connector and is backward compatible with PCIe 2.0. A PCIe 1.1 system has a transfer rate of 2.5GT/s. PCIe 2.0 has double of PCIe 1.1 i.e; 5GT/s. PCIe 3.0 will increase the transfer rate from 5 GT/s of PCIe 2.0 to 8 GT/s, but will not require the same encoding mechanism. therefore PCIe 3.0 will double total available bandwidth as compared to PCIe 2.0. PCI express 3.0 support will be released on 65 nm technology or thinner. The first products with PCI express 3.0 support will be motherboard , video card and some server solutions. One benefit of PCIe 3.0 would be the ability to build higher-end graphics cards that uses a smaller PCIe slot interface. This, in turn, could open up chances for higher-end graphics capability in system form factors that are currently too small to use large x8 or x16 slots.